Lightly spray bundt pan or gelatin mold with non stick cooking spray (I used a 10 cup bundt pan). Wipe off the excess spray with a paper towel. A slight residue should remain, just enough to help unmold your gelatin, without affecting the taste or appearance. Pour 3/4 cup water into a saucepan and sprinkle with 1 teaspoon of the plain gelatin. Allow gelatin to soak for a minute or two. Heat over low heat, stirring constantly, until gelatin is dissolved (about 5 minutes). Whisk in the first package of flavored gelatin. Whisk for at least 2 minutes, or until completely dissolved (I find the sugar free mix dissolves much faster than the regular). Pour 3/4 cup of the gelatin mixture into the prepared mold, and place in refrigerator. Allow to set for 20 to 30 minutes, until the gelatin is a little firm, but still sticks when touched. Very important – if the layers set up too much, the next layer won’t bond appropriately. Gently spoon the gelatin/yogurt mixture over set gelatin and return to the refrigerator. Refrigerate about 15 minutes or until gelatin is set but not firm (again, it should stick to finger when touched). As the layers progress, the setting time will become shorter as the pan and gelatin becomes colder, and the layers become thinner as more layers are added to the mold. 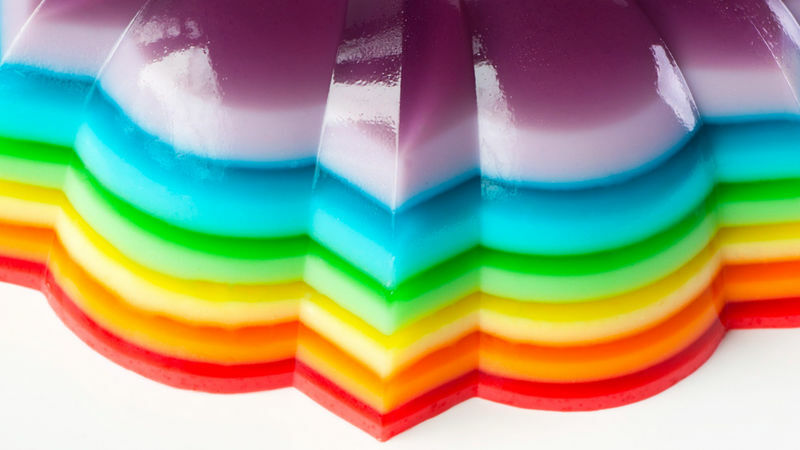 After completing all the layers, refrigerate the gelatin overnight. To unmold, fill a larger container or clean sink with warm water (not too hot!). With clean fingers, loosen the gelatin around the edges of the mold cavities. Next, dip the mold almost to the edge into the warm water for just a few seconds (10 seconds worked for me). Dry the bottom of the mold with a towel and check the edges to see if they are loose. If not, repeat the dip for just a few seconds. Place your serving plate on top of the mold and invert. I did some (unsuccessful) research to identify the author of the original recipe for Rainbow Ribbon Salad, which has been the holy grail of American gelatin desserts for as long as I can remember. Not surprising, really – this layered concoction is the J-Lo of jiggly desserts - down to earth and completely approachable, yet strikingly lovely. It is also certainly as enthusiastically received as any celebrity/pop star/actress/TV personality! Given its iconic status, the Rainbow Ribbon Salad was due for a little spin, JSTK style. Ladies and gentlemen, allow me to introduce to you the Spiked Rainbow Ribbon Salad recipe. A star has been born. I added vodka to each layer – blueberry flavored vodka, to be specific, which was wonderful! But any flavored vodka or rum would work well. I also added a little unflavored gelatin, to provide ballast while sitting on a buffet table. The result is a “cocktail” version of the classic, with all the sweet, creamy, layered rainbow goodness of the original. Spiked Rainbow Ribbon Salad makes a beautiful addition to any party. While the preparation is super easy, with 12 layers, it’s a bit of a project due to the timing and setting of each layer. While preparing this dessert is not for the faint of heart, it is simply spectacular and worth the effort for any special event – I will be making this several times this spring and summer! Hope you enjoy!